Senate Democrats are frantically searching for the one more vote from the other side of the aisle they need, which would guarantee the passage of a resolution to restore net neutrality. 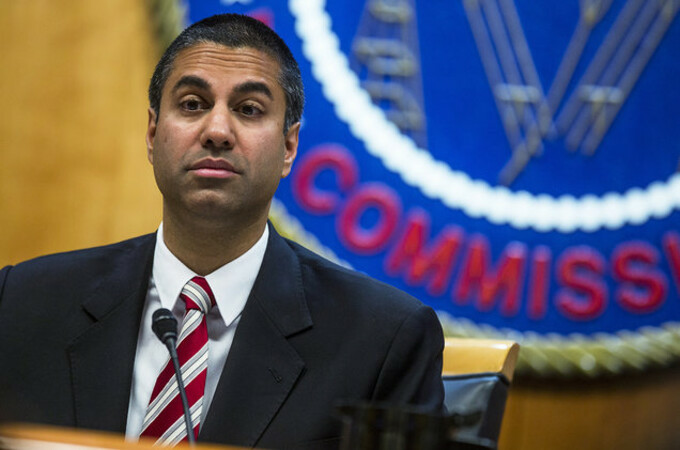 The Trump FCC has repealed net neutrality and the Senate has 30 days left to overrule the FCC's decision. For those unfamiliar with the concept, net neutrality prevents carriers/ISPs from charging more for subscribers to visit certain websites or to favor certain content. Speaking of net neutrality, Apple originally rejected an app that would have allowed users to determine if net neutrality is being violated. Developed by David Coffnes, a researcher at Northeastern University, Wehe can detect if certain apps are being throttled by a mobile carrier or an internet service provider. The user first signs an online consent form (Coffnes is collecting data for his research) and clicks on "run test." Wehe computes download speeds from seven apps: YouTube, Amazon, NBCSports, Netflix, Skype, Spotify, and Vimeo. 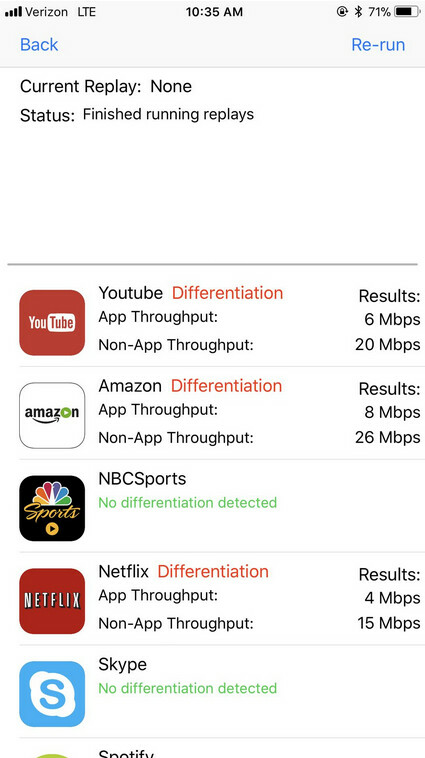 A screenshot of the app being run reveals "Differentation" over Verizon's network for YouTube, Netflix and Amazon. That indicates that these apps are being throttled by Big Red. Developer Coffnes says that this is the sort of information that people would like to know. With the data in hand, consumers can opt to switch carriers, or they could complain to the FCC. As we noted, Apple first rejected Wehe with one App Store reviewer telling Coffnes that the researcher's app "has no direct benefits to the user." But the company had a 180 degree change of heart, and has now approved it for the App Store. Video streaming content is usually the prime example when we discuss carriers' throttling practices and net neutrality. However, after a lot of testing and investigation, David Coffnes and team eventually found that carriers typically don't throttle content based on type; for example, the rule doesn't look like this: "if video, then throttle". Instead, it turns out carriers look for specific meta data – keywords somewhere inside the data stream that may, in some way, describe the content as video, and thus – a potential target for streaming speed management. Such keywords could be "video" or "netflix". For example, in one of the examples provided by Coffnes, in a test data stream that initially included the text "nflxvideo.net", he found that throttling occurred right away. After changing just this piece of text to "northeasternvideo.com", throttling was disabled and streaming speed returned to normal. This discovery, of course, isn't meant to reveal a technique that could be eventually used by certain content providers to 'escape' throttling, but is a valuable insight into how carriers currently go about throttling nonetheless. In the future, tools similar to what Coffnes' team has created may prove instrumental to revealing provider throttling practices, providing a much needed level of transparency into the issue, and helping users be more informed as to which content or service providers would better suit their needs. It should have been approved in the first place. Coz it’s users’ right to know about this issue. Agreed. But good on apple regardless. This will open some eyes and (hopefully) spark some much needed change in the industry. He actually want to say "has no direct benefits to Apple.". But Apple in a s**tty condition now, and they need to calm their customers and stock holders..
Why do you think Apple is in that condition? Why did Trump repeal net neutrality? to give more welfare to the big corporations. To lets corps have the upoer hand iver everyone else simply because they have mode money. After all, since a Corp like Netflix has more money, than say an Xfinify customer, then why shouldn't he be able to pay for faster better access? Now in fairness I say, yes a person should get more or a better option. If they are willing to pay. But the Internetis a public highway, and we all should have the same equal access to it. The problem. Is, Comcast and other Risks, wanna limit us to drive the rich corps better access and that's wrong. i'm not able to find "wehe" in the app store. just me? Most probably Apple needed some time to remove or alter their own differentiation rules. Apple didn't have a change of heart. Apple saw that they were getting bad press on this and pivoted to stifle the bad press. Apple does *not* support Net Neutrality outside of one limp-wristed press release. In reality, Apple actually stands to benefit from overturning it. Stifling competition with its deep pockets Apple can afford to out pay and get top priority traffic lanes over any upstart that comes along that challenges iTunes. Apple has a ton of money and no where to spend it.